Early devotion to the Sacred Heart of Jesus found support from Church fathers, medieval theologians, 13th- and 14th-century mystics, 16th-century Jesuits, and, most famously, Visitation Sister Margaret Mary Alacoque — but not the Church of Rome. Alacoque had visions between 1673 and 1675 in which, among other requests, Christ asked her to establish a feast of the Sacred Heart. Word of the visions helped popularize and define the devotion, but did little to sway Church opinion. Finally, in 1765, Pope Clement XIII allowed the feast to be celebrated in a limited capacity. It eventually gained greater status and, today, is considered a solemnity. Objectors said the devotion lacked doctrinal or scriptural roots, describing it as overly sentimental. Pius XII responded to these objections in Haurietis Aquas, defining the devotion as “a worship of the love with which God, through Jesus, loved us:’ as well as an exercise in loving others. Trying again, the women went to St. Stanislaus Kostka Church. There, they achieved a more lasting success. With the generous help of a foundation set up by the Countess Maria Stadison Van Thannhausen, property for a church was purchased and a Resurrectionist priest, Father Theophile, agreed to visit Melrose Park on a regular basis. The parish charter was granted on July 7, 1893. 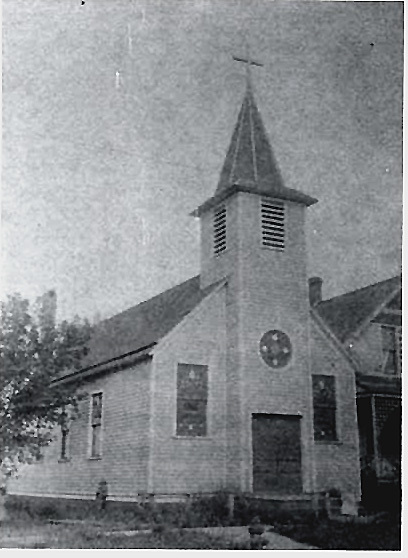 At first services were held in a small chapel and private homes, but in 1894 parishioners erected a white frame building of their own on the newly purchased lot at 21st Avenue and Iowa Street. It seated 125 people and was the fourth Christian church serving the village. Within a year, Father Theophile resigned, and the parish remained without a priest until Father Joseph Stumpe, the first resident pastor, arrived on Christmas Day, 1895. 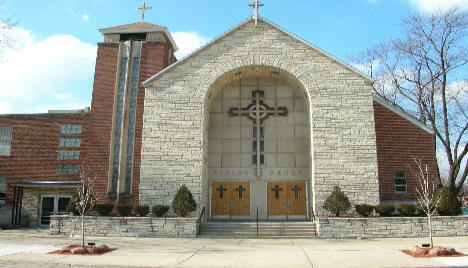 His stay, however, was only two years, after which Sacred Heart became a mission church of St. Luke’s in River Forest. Mission status lasted until 1900 when the parishioners appealed for “a resident pastor of their own.” In anticipation of the new pastor, a rectory was rented at what is now 16th and Augusta. Within a month of his arrival in late June, the new pastor, Father Burelbach, announced plans for a new school, and the purchase of the block of property (the present site) to serve the 151 Catholic families residing in the area. That September, a school was established, which was staffed by the Poor Handmaids of the Lord. There were ten students, and classes were held in a rented two-story store building at 14th and Superior Street. The following month, approval was obtained for construction of a large two story brick combination building on the new property. Construction started the next Spring and the first Mass was said there on September 22, 1901. The church seated 325 worshipers and occupied the first floor of the building. The second floor had school rooms in the front and a small convent for the nuns at the back. Over the next few years, many improvements were made to the property. A brick rectory was built on Rice Street in 1904. 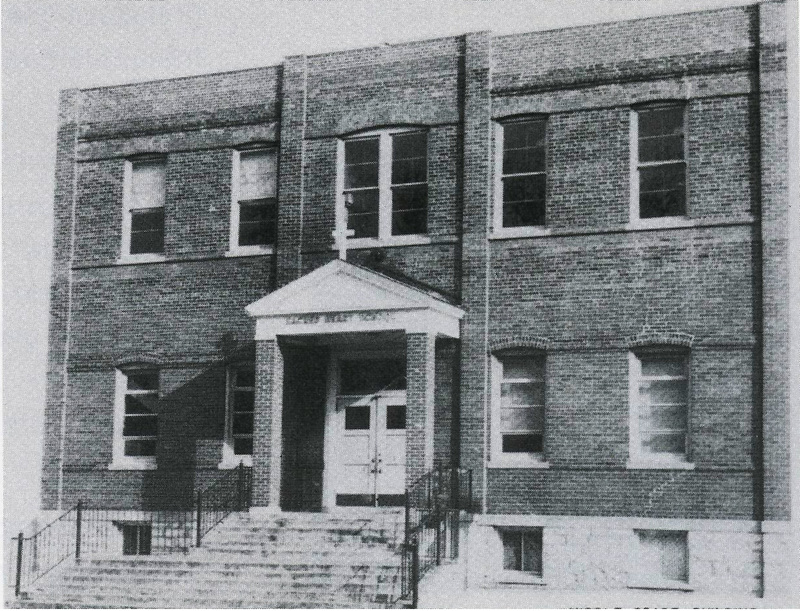 A frame two story building, was moved to the North side of the property in July, 1906, and remodeled into a convent. By 1920, a wooden bell tower had been built next to the church and central heating replaced the coal stoves in the main building. There were gardens, one for the rectory, the other for the convent, and a softball lot. There was even an outdoor bowling alley. Then, life suddenly changed. 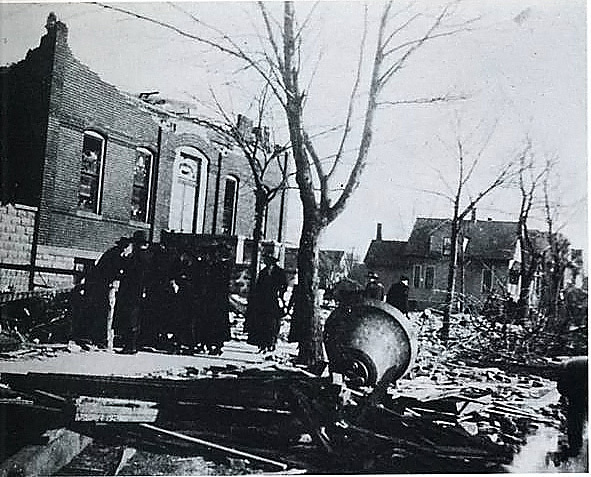 On Palm Sunday, March 28, 1920, a tornado struck with devastating force. The parish buildings were left in near ruins. Fortunately there were no fatalities. Three nuns were trapped in the basement of the convent, one of whom was injured seriously. Of the 86 families in the parish, 18 were left homeless. The parish had a debt of $21,000, and there was no insurance. Plans for rebuilding started almost immediately. School was canceled for the remainder of the year. Seventh and eighth grade boys cleaned bricks at ten cents each, credits to be redeemed at the upcoming parish carnival. Since little money was available, a few small rooms at the back of the school were converted back into a convent when the upper floor of the combination building was restored. In the church, a ceiling -- which would stay in place until the church was converted into school rooms thirty years later -- was fashioned from donated cardboard and wood lath, and installed by parishioners. To pay for the rebuilding, the parish made various appeals and held an annual carnival. The pastor at that time, Father Knur, personally raised more than $25,000 in donations through appeals at different parishes in the city. Nevertheless, when he was replaced by Father Lieblang in 1927, the parish remained in poor financial condition. Despite the financial problems, Father Lieblang was quick to remedy the intolerable living conditions of the nuns. He had a new rectory built on Iowa Street and turned the Rice Street rectory into a convent. Seven years later, He made one of his most lasting decisions when he invited the Sisters of Saint Francis at Dubuque to take charge of the school. They have been a primary influence on our children since the first six Fransicans arrived on a September day in 1934, led by Sister Emilia Pottebaum. During his life Father Lieblang was never able to realize his dream of a new church. However, when he died on December 18, 1949, after twenty-two years as pastor, his legacy was a parish not only free of debt but one with a sizable building fund. That fund would soon provide critical help in the explosive growth that was just around the corner. Three weeks after Father Lieblang's death, Father Augustine Freeman became the sixth resident pastor of Sacred Heart Church. When Father Gus arrived, the first post World War II babies were nearing school age and the school was ready to burst at the seams. Barely three months after his arrival, architectural plans for a new church, school and convent buildings were a reality. Construction was planned for that summer. But, when the start of the Korean war in June drove building costs up dramatically, it became obvious that the ambitious building schedule would have to be scaled back. Only the Primary Grade Building was built, and it was ready to receive its first pupils in September, 1951. That first new building was only a start. Over the next six years, a year rarely passed without another major construction project at the parish. Since building plans for the new church were indefinite, the old church was completely refurbished: new pews, terrazzo flooring, stain glass windows, a new organ to replace the foot pumped original, and “real confessionals.” In short, the old building was almost completely rebuilt. A new garage was built behind the rectory. The school grounds were forever changed when black top replaced the mud and gravel surface. Then, in 1953, an addition was built onto the convent to house the growing number of nuns. Finally, in the Spring of 1954, amid a major pledge drive to reduce parish debt, the new church took shape. It was built over the baseball diamond used by generations of school children. When completed in October, it was furnished with many of the things bought for the recent remodeling of the old church. The old church was renovated that very year to provide needed rooms for the school. The Summer of 1957 marked the last phase of major construction. It was the year the new convent and Upper Grade Building were built, and the rectory was expanded. In the years that followed, school growth continued on an upward spiral. In 1957, the student body consisted of 759 students; by 1959, there were over one thousand; and, in the peak year of 1965, the school exceeded twelve hundred students. The costs of building and subsequently maintaining such a large parish plant were enormous. Nevertheless, by the time Father Freeman was granted retirement in 1966, parish debt had been reduced from a high of $1,350,000 to $525,000. He would live on at the rectory as Pastor Emeritus. We lost him in May, 1991, over forty years after he first arrived at Sacred Heart. Despite the enormous changes he effected during his years as pastor, the most enduring memory that marked his stay at the parish was a simple hug; just ask anyone who was a child during the years he was here. Father Kniewel arrived in 1967, the year before the parish celebrated its 75th jubilee year and two years after Pope John XXIII presided over the closing of Vatican II. Parish life was facing major changes. Some of the first effects of that council were felt at the school. The student body was getting smaller, but costs were sky-rocketing. Nuns were expected to be self-sufficient, which drove school costs up. Teachers’ salaries had risen every year since Kay Maiers, who taught first grade and was the school’s first lay teacher, was hired in 1949, but soon lay teachers outnumbered teaching nuns. There were also many new educational programs to implement, mandated by both the state and the Archdiocesan School Board. The school became one of the best in the area -- it was the pride of the parish -- and Father Kniewel worked tirelessly in its support. When Bingo was legalized, the Monday night games became a major source of school funding. Cabaret, a showcase for parishioner talent that took over the school and Marian Hall each Spring, was started in 1972, guided by a yong assistant named Father Militello, who later would also author the Fall Drive, an annual appeal that, to this day, remains a major source of parish funding. When Father Kniewel retired in 1981, joining Father Freeman as the second Pastor Emeritus at the rectory, the school was smaller, but the education was first rate. Father Cosmo Militello came back to Sacred Heart as pastor on January 1, 1981. Since his return, the church debt has been paid off, an event in 1984 that the parish celebrated with its biggest dinner dance, to date. He also made the difficult decision in 1986 to raze the old combination building. It had been abandoned for over ten years and was no longer needed by the school. As pastor, Father Cos reinvigorated parish life, and moved it further into the post Vatican II era, shaping it for the future. He revitalized the Women’s Club and Holy Name Society, and actively involved the parishioners in the school board, and parents in the P.T.O. New activities included the occasional St. Joseph’s table, annual fashion show lunch, a corned beef and cabbage dinner, and the many other functions that encourage an active participation in parish life. Involvement in parish religious life has also thrived and grown. We celebrate our centennial year with three ordained deacons. There are catechetical classes for public school children, and other religious programs of many kinds. We salute with deep affection the many dedicated people of our past who helped build Sacred Heart Parish, and we look forward to those who will give meaning to our tomorrows. Every September since 1977 there have been devotions at Sacred Heart Church in honor of Our Lady of Charity. The celebration first took shape in 1974 when Cuban-American residents in the area, led by parishioner Alicia Lopez, began to collect money for a shrine to honor the patroness of their former homeland. After several years of donations, bake sales and benefit dinners, and with the blessings of the pastor, Father Kniewel, the shrine to Our Lady was erected at the back of our church in the small chapel that formerly housed the baptismal font. Each year, the religious celebration lasts several days with the rosary and devotions in Spanish. It culminates on Sunday, with an afternoon Mass and outdoor procession, during which the participants sing Cuban hymns and young children carry traditional offerings, such as sugar cane and coffee.